Retrofuturism is the act of looking back at how we used to look to the future. It is a review of historical images and writings about the future. When the history of foresight is explored for education, entertainment, or in modern art, we call it retrofuturism. The blog Paleofuture offers a lovely collection of retrofuturist depictions and text, beginning in the 1870s. It is alternately hilarious, inspiring, sobering, and educational. When this looking back is done rigorously and formally, to find insights about how we look at the future, and about our own future, we call it historical foresight analysis (HFA). HFA can tell us a lot about what kinds of STEEPS (scientific, technological, economic, environmental, political, and social) change have been repeatedly successfully predicted, and what kinds of change have been less predictable. It can tell us a lot about the kind of mindsets and processes we need in order to be good predictors, and the way our individual and cultural assumptions, motivations, and biases affect our ability to see ahead. HFA tells us that history matters. The better we learn and understand past trends, cycles, models, and causal factors, the better we can see ahead. History Matters! is one thus of the slogans of this Guide. History is our necessary starting point in preparing for great foresight work. A good HFA example is Technological Forecasting: 1970-1993 (PDF), by Coates et al., Tech Forecasting & Social Change (1994). This study is one of several that have observed that developments in certain technology classes, including information and communications technologies, have been significantly more predictable than others in recent decades. We’ll say more about special classes of technological predictability in Chapter 7. When we look back at these examples of futures past, we find much that is artfully creative and imaginative, exploring possible futures. We also find much that is aspirational (visionary) describing various preferable futures. Some of these preferences are timeless, still with us today, and reflecting culturally universal values and goals, and other are products of their local environments, perhaps appropriate then but anachronisms now, as a result of adaptive trends in cultural development (social progress). We also find great anticipations (predictions) of probable futures that were clearly seen, even obvious to certain futurists or foresighters at the time. Understanding the backgrounds, processes, and contexts of those predictions can help us better anticipate change today as well. Of course, we also find many predictions that failed, and we will discuss how to predict better throughout this Guide. But first, let’s look at a few examples of predictive success, to get a sense of the value that better prediction can bring to the world. 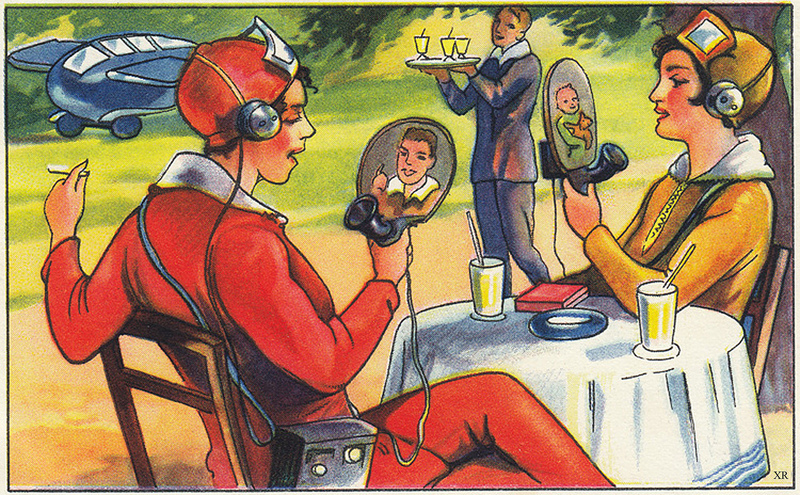 Consider this image from a late-1930’s German magazine, anticipating the wireless videophone. See RetroFuture.com and r/RetroFuturism for it and many more. This anticipation was a natural mental leap for its author, as German engineers had recently demonstrated the world’s first public videophone, across 100 miles of coaxial cable between Berlin and Leipzig, in 1936. Contemplating that advance, and turning the device into a wearable wireless, the artist foresaw the way smartphone users might easily be lured to focus on their virtual over physical conversations, seventy years before the iPhone (2007). There are surely tens of thousands of such small yet clear insights about the nature of our near and long-term future occurring all around us today. The good news is that, unlike the past, we can use digital platforms to collect, teach, critique, and profit from those insights, far easier than ever before. They aren’t ignored and forgotten the way they used to be. 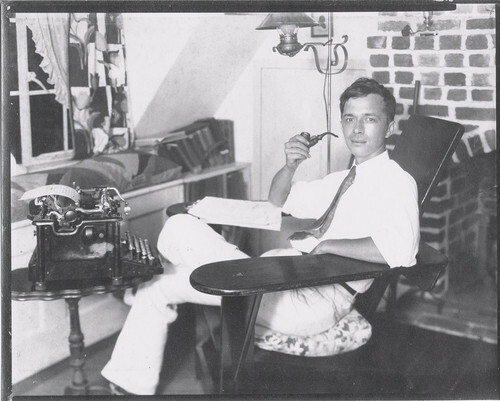 in his home study, 1930s. Great predictions can also inspire, guiding people to make them true even many decades later. Consider Vannevar Bush’s Atlantic essay As We May Think (1945), which gave technologists a vision of the visual hypertext world wide web. This essay had deep influence on many future thinkers and builders. Bush’s vision of a global public resource of updatable pages and links was both exciting and compelling. His proposed engineering approach of microfiche was impractical, but it was a highly motivating vision nonetheless. Once the right technology became possible, it materialized just as predicted. Doug Englebart was one of those whose future vision was deeply influenced by Bush’s essay. Englebart went on to develop electronic hypertext, the mouse, networked computers, and a graphical user interface, all of which he first displayed simultaneously in what is called the Mother of All Demos (see the YouTube video) in 1968. After Microsoft was blindsided by the rapid rise of the web in the 1990s, an oversight that led to the founding of Google to fix the poor state of internet search in 1998, Bill Gates is reported to have joked to his team, “find me the person (at Microsoft) who predicted the (very rapid rise of the) web, and we’ll make him CEO.” Yet any good retrofuturist (student of the history of prediction) knows that Jenkins did exactly that, in 1946. A steady stream of visionaries after him (Doug Englebart, Ted Nelson, and many others) did so as well. They saw how big its potential was going to be. The problem with human culture, until very recently, is that our collective memory for the visionaries who “got to the future first” has been very poor. But with new digital and crowd foresight tools we will discuss later, finding those early accurate visionaries gets better every year. We’re digging the Bush’s, Jenkins’s and Nelson’s out of our historical record, and telling their stories increasingly well. Meanwhile, academic groups like the Good Judgment Project and Good Judgment Open are showing how well average people can predict, when they learn to adjust for their biases. See Tetlock’s Superforecasting (2016) for more on the untapped power of crowd prediction. Eventually, our culture will lose the damaging and self-limiting bias that “predicting the future doesn’t work.” Let’s say it again: History matters!